Published in Rafu Shimpo, June 25, 1956. Gardena Chamber of Commerce honored natrualized citizens, such as Frank Toshinori Yamauchi, at a citizenship banquet held at Western Club cafe in Gardena, California, June 22, 1956. 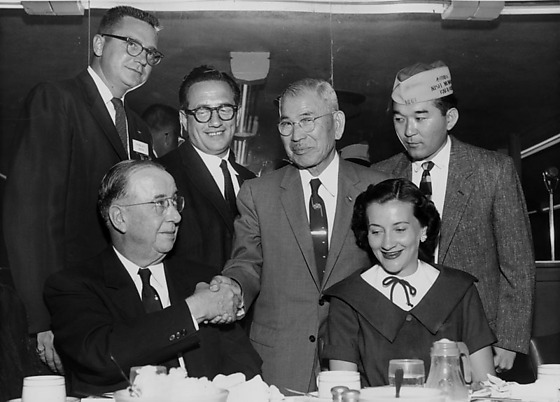 Includes Yamauchi, an older Japanese gentleman in suit and eyeglasses shaking hands with Mayor Thomas K. Ware, a Caucasian man in a suit and eyeglasses seated at table next to his wife. Attorney Dudley Gray, left, emceed the event; Albert Greenberg, Gardena Chamber of Commerce president, offered his congratulations. Veteran Seiji Imamura wears a garrison cap at right. Mirrored wall in background. Typed on original negative envelope: Gardena Citizenship Banquet at Western Cafe.